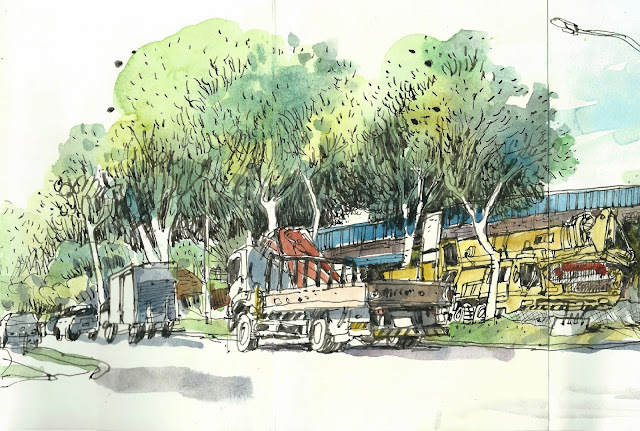 [Singapore by TIA] Last Friday, we brought students to an old industrial estate to sketch. I began the left side as a demonstration to the students and continued to sketch in my Moleskine concertina sketchbook when they started sketching on their own. Geylang Bahru Industrial Estate comprises 18 blocks of single-storey terrace workshops for clean and light general industrial trades and canteen. The leases for these units are less than ten years. The future of these old factory is uncertain. This factory types play a very important part in the development of Singapore as they are the first generation in our industrial building. Walking around the area is like walking down the memory lane for my generation. I saw a rattan factory, advertising, manufacturing, hardwares and even funeral services. This corner unit of block 91 is sand supplier with many packed jumbo sand bags stacked in front of the shop.